Home ¦ Introduction To Paganism ¦ What is a Magic Circle? To Dare, To Will, To Know, To Keep Silent. "....the MAGIC CIRCLE provides a sacred and purified space in which all rites, magickal work and ceremonies are conducted. It offers a boundary for a reservoir of concentrated power and acts as a doorway to the world of the gods...Within the circle it becomes possible to transcend the physical, to open the mind to deeper and higher levels of consciousness." The word magick is spelt with a 'k' in the context of the circle as a central part of many Mystery Traditions, to differentiate this use of the energies of the universe from stage-show magic and sleight of hand. Many practitioners of the magick arts, both past and present, use a magick circle as a place of spiritual and inner reflection. 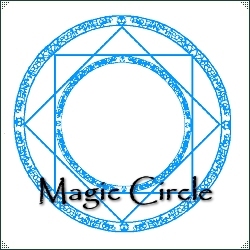 Forms of magick circles were used in Babylonian magic, as did Ceremonial magicians of the Middle Ages and the renaissance, certain American Indian tribes also used the circle, although not for the same reasons. Mediaeval magicians considered the circle essential and great emphasis was placed upon its exactness. Many had elaborate design with multiple layers of complex symbology and words. It was also important that the circle was complete and contained no breaks. For the Ceremonial and Qabalist magician, the circle is a place of protection during magickal workings. The word circle is a misnomer, however, as it is a spheriod and extends not just around the magician but also above and below, the circle only marks the point on which it touches the earth. There are many ways of looking at a magick circle and each practitioner will have a different method, view or use of it. 1. Altered State of Consciousness. The circle causes an alteration of the consciousness, transporting the mind from the mundane to the magickal. 2. Temple. The circle becomes a temple, a sanctified and sacred place for the communion with the divine. 3. Sacred Space. In a similar fashion to the Temple, the circle serves as a sanctified place for the consecration of objects and people or as a place to mediate or simply as a refuge from the mundane. 4. Protection. The circle becomes a shield or barrier against external forces. 5. Magickal Filter. Here the circle acts as a filter, allowing in those energies that are efficacious to the magickal working and keeping out detrimental energies. 6. Power Concentrator. The circle keeps in the energy created by the magician and focuses it into a concentrated Cone of Power, until it is released. 9. Omnipresent Now. The circle allows us to take advantage of non-linear time, while allowing the magician to remain with normal linear time. In the timeless reality, all things exist or have existed or will exist, in this realm the magician performs acts of scrying and divination. 10. Akashic Egg. The circle represents the eternal cyclic nature of the universe with neither a beginning or an end. The creative force is given form as a circle. 11. Extension of the personal aura. The circle becomes a projection or externalisation of the personal aura of the magician. 12. Crucible of Change. The circle changes the magician who enters it and the environment surrounding the magician. 13. Alchemical Catalyst. The circle forces the magician to re-examine self and true self, to realise our abilities and limitations and overcome them. The magician becomes part of the alchemical transformation of self into the image of True Self. The way in which the circle is divided also define and effect the environment and the energies created within the magick circle. The circle is normally quartered, each of The Quarters or Watchtowers correspond to cardinal points on the compass. Each point corresponds to one of the four Elements, North - Earth, East - Air, South - Fire and West to Water. Each of the Elements has certain properties an energies.